The fiber reinforced plastic (FRP) pedestrian bridge at Cuyahoga Valley National Park. 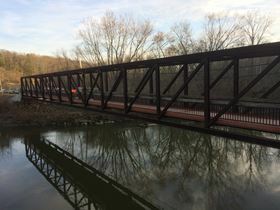 Officials at Cuyahoga Valley National Park in Ohio, US, have ordered a fiber reinforced plastic (FRP) pedestrian bridge to replace one in which rotting timbers and corroding steel forced the federal agency to close the structure. Composite Advantage (CA) won a bid to replace the structure with its FiberSPAN bridge deck system. The FiberSPAN bridge deck is 212 ft long, 8 ft wide with attached curbs. It was installed in March 2016 on a new substructure comprised of weathering steel stringers. Ten FRP panels were attached with stainless steel connection clips. With a live load rating of 90 psf and a maintenance vehicle loading of H-5, the large prefabricated panels eliminated the man-hours typically associated with assembly of multiple smaller components and tasks, such as pouring concrete. The deck has a Matacryl quartz aggregate wear surface and weighs 7 pounds per square inch. To address the corrosion issues previously associated with Hillside’s steel superstructure, high elongation sealant was applied to panel-to-panel joints. Drainage scuppers were also added to select deck panels. A teak color was chosen for deck and wear surface to match the color of the weathering steel, and make rust stains from the steel less noticeable over time. This story is adapted from material from Composite Advantage, with editorial changes made by Materials Today. The views expressed in this article do not necessarily represent those of Elsevier.